Card catalogs are an endangered species in libraries, but they are extremely popular for a variety of uses in home and business. For a history of card catalogs click here. For some examples of catalog cards and some fun uses of catalog cards click here. 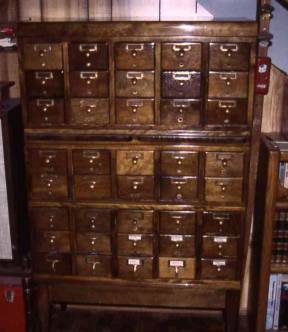 A card catalog cabinet in Powell's candy store on Pearl Street in Boulder, Colorado. 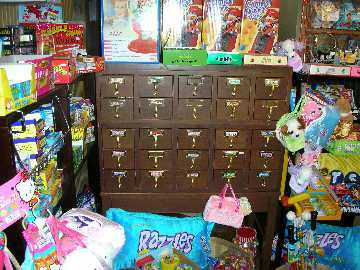 The drawers are used to store different kinds of candy. The Lake Geneva Public Library (WI) created a permanent display in the foyer of the library to acknowledge gifts to the library building fund using the fronts of old card catalogs. In March, 1982, the editors of American Libraries challenged readers to come up with clever uses for card catalogs that had been replaced by automated catalogs. Some 200 suggestions were received. A group of 22 winners was revealed in the November, 1982 issue of the magazine. To file food and recipes A to Z. Professional organizer Jeri Dansky's Ode to the Library Card Catalog in her blog "Jeri's Organizing & Decluttering News". The Desire to Inspire Blog has brought together images of different uses of cards catalogs found on Flickr. 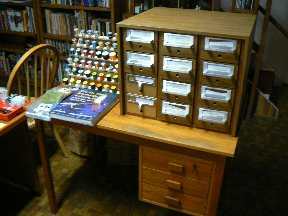 The April, 2002 issue of American Libraries included a picture and brief sidebar about the use of an old card catalog by an elementary school library as a focal point in the children's room. The drawers were opened and stuffed literary characters including Pooh, Clifford, and Wild Thing were placed in them. The Cat in the Hat sits on top of the catalog. Page 22. My wife and I have three card catalogs. I use two of them primarily to store a variety of my librariana collectibles including envelopes, postcards, bookmarks, buttons, and smaller items. My wife uses one of the cabinets to store her fly tying supplies. 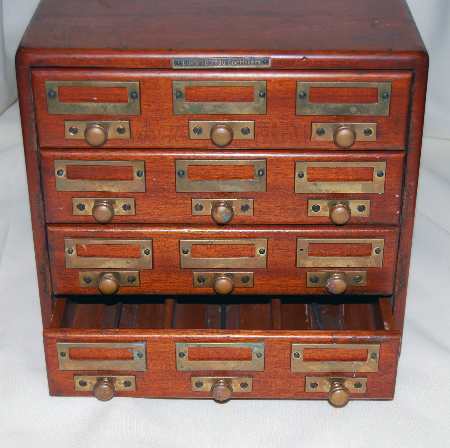 This Library Bureau four tray (12 unit) cherry card catalog cabinet is owned by Norman D. Stevens. Undated in any fashion it is 10¾” wide, by 13” deep, by 9 ¾” high; it was designed to hold cards measuring 2” by 2 ¾” that are an unusual size. According to Stevens, it was purchased at an antique store and no information about its former place or use is available. This 12 tray Library Bureau card catalog belongs to Norman D. Stevens who provided the following information. "According to the U. S. patent information on the blocks that hold the cards in place it was manufactured after May 1903. This cabinet is 13¾” wide, by 15½” deep, by 19¼” high; it holds Harvard College size cards (2” x 5”) that were one of the two standard sizes adopted at the first American Library Association conference in 1877. It was formerly used at the Middlebury College Library in Middlebury, VT. This card catalog is located at the New York Mercantile Library. It is not longer active, but it contains the smaller Harvard size library cards. The catalog drawers contain two roles of cards (see below). Oberlin College Library's early card catalog history. How do you find a card catalog cabinet and how much should you pay for it? More and more people are discovering the utility of a card catalog cabinet. Even though many libraries have or will discard their physical card catalogs, the demand for these used treasures is heavy. As a result, bargains are not as common as they once were. 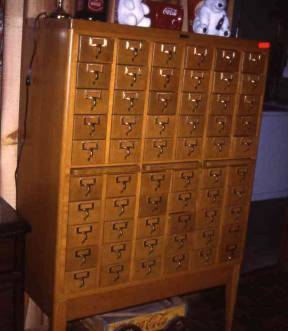 A vintage card catalog cabinet is much the same as any other antique piece of furniture. A quality piece is going to cost much more than other alternatives. Quality is based on age, condition, construction, and materials used. Size is also a factor. Smaller card catalog cabinets seem to be more desirable and usually have a larger per drawer price. 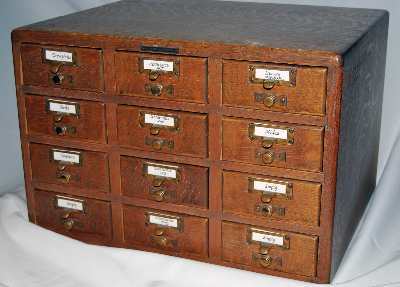 The Library Bureau, founded by Melvil Dewey, was one of the most prolific makers of card catalog cabinets. Early examples of these cabinets in good condition receive a premium price. They have a tag on the front of the catalog that reads "Library Bureau Sole Makers". More recent card catalogs which utilize more plastic and less wood are less expensive. Prices can range from a low as $50 to more than $2,000. If you find a quality card catalog cabinet for under $500, you have a bargain in my estimation. There are usually several card catalog cabinets up for auction on eBay. Search under "library card" or "card catalog". Craigslist is another possibility. These two options may pose a problem in getting the cabinet home once you make a purchase. My advice is to periodically contact as many antique dealers and malls in a reasonable distance of your home to see if they have one. Let any friends who are antique or collectible hunters know that you're in the market for a card catalog. Persistence will eventually pay off.